What type of electronic component do these symbols represent, and what special function does it perform? These are varistors. Sometimes they are referred to by the acronym MOV, which stands for Metal Oxide Varistor. I'll let you research what is unique about the behavior of these devices. Follow-up question: plot an approximate graph of current versus voltage for a varistor, and comment on how this compares to the current/voltage characteristic of a normal resistor. Ask your students to reveal their information sources used when researching varistors, and also if they were able to determine how these devices are constructed. Explain how a surge protector functions: the kind of device used to protect electronic equipment against common power line voltage transients. Draw a schematic diagram to accompany your explanation. Some surge protectors use varistors, others use zener diodes, and others use more advanced technologies. I'll let you research designs and schematic diagrams on your own! Ask students how a surge protector (or surge ßuppressor") is similar in principle to clipper circuits used for small electronic signals. What purpose do the two diodes serve in this circuit? Hint: if you remove the diodes from the circuit, you will not be able to hear the difference in most cases! The diodes serve to protect the listener from very loud volumes, in the event of accidental connection to a large voltage source. 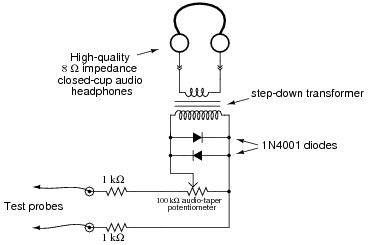 Review question: the purpose of the transformer is to increase the effective impedance of the headphones, from 8 W to a much larger value. Calculate this larger value, given a transformer turns ratio of 22:1. My first encounter with this application of diodes came when I was quite young, soldering together a kit multimeter. I was very confused why the meter movement had two diodes connected to it in parallel like this. All I knew about diodes at the time was that they acted as one-way valves for electricity. I did not understand that they had a substantial forward voltage drop, which is the key to understanding how they work in applications such as this. While this may seem to be a rather unorthodox use of diodes, it is actually rather common. Incidentally, I highly recommend that students build such an audio test set for their own experimental purposes. Even with no amplifier, this instrument is amazingly sensitive. An inexpensive 120 volt/6 volt step-down power transformer works well as an impedance-matching transformer, and is insulated enough to provide a good margin of safety (electrical isolation) for most applications. An old microwave over power transformer works even better (when used in a step-down configuration), giving several thousand volts worth of isolation between primary and secondary windings. The circuit even works to detect DC signals and AC signals with frequencies beyond the audio range. By making and breaking contact with the test probe(s), ßcratching" sounds will be produced if a signal of sufficient magnitude is present. With my cheap "Radio Shack" closed-cup headphones, I am able to reliably detect DC currents of less than 0.1 mA with my detector! Your mileage may vary, depending on how good your hearing is, and how sensitive your headphones are. I have used my own audio detector many times in lieu of an oscilloscope to detect distortion in audio circuits (very rough assessments, mind you, not precision at all) and even as a detector of DC voltage (detecting the photovoltaic output voltage of a regular LED). It may be used as a sensitive "null" instrument in both AC and DC bridge circuits (again, DC detection requires you to make and break contact with the circuit, listening for "clicking" or ßcratching" sounds in the headphones). Another fun thing to do with this detector is connect it to an open coil of wire and "listen" for AC magnetic fields. Place such a coil near a working computer hard drive, and you can hear the read/write head servos in action! If it isn't clear to you already, I am very enthusiastic about the potential of this circuit for student engagement and learning . . .
Diode D1 fails open: No effect on small signals, clipping of large signals will be incomplete (only one-half of the waveform will be clipped in amplitude). Diode D1 fails shorted: No sound heard at headphones at all. Transformer T1 primary winding fails open: No sound heard at headphones at all. Resistor R1 fails open: No sound heard at headphones at all. Solder bridge (short) past resistor R1: Volume (slightly) louder than usual. Wiper fails to contact slide in potentiometer: No sound heard at headphones at all. The diodes are model 1N4001, each. The resistor's color code is Brown, Black, Orange, Silver. The output will be a square wave with a peak-to-peak voltage of approximately 1.4 volts. Ask your students why the waveform will be square rather than sinusoidal. Is it a perfect square-wave? Why or why not? This circuit is not difficult to analyze if you consider both half-cycles of the AC voltage source, one at a time. Ask your students to demonstrate this method of analysis, either individually or in groups, at the front of the classroom so everyone can see and understand. Diode D1 fails open: No output voltage at all. Diode D1 fails shorted: Full AC signal at output (no clipping at all). Resistor R1 fails open: No change (if diode is indeed ideal), but realistically there may not be much clipping if the receiving circuit has an extremely large input impedance. Resistor R1 fails shorted: No output voltage at all. Diode D1 fails open: Full AC signal at output (no clipping at all). Diode D1 fails shorted: No output voltage at all. Resistor R1 fails open: No output voltage at all. Resistor R1 fails shorted: Normal operation if source impedance is substantial, otherwise diode and/or source may be damaged by direct short every half-cycle. Note: the circuit shown here is not the only possible solution! Follow-up question: the output waveform shown for this circuit is true only for an ideal diode, not a real diode. Explain what the output waveform would look like if a real diode were used, and recommend a diode model that closely approximates the ideal case for this application. A good review of basic diode concepts here. Students should recognize the output waveform as being indicative of half-wave rectification, which may cause them to think of other circuit designs. Follow-up question: explain why a Schottky diode is shown in this circuit rather than a regular silicon PN-junction diode. What characteristic(s) of Schottky diodes make them well suited for many clipper applications? Ask your students whether they would classify this circuit as a series or a shunt clipper. If your students are unfamiliar with Schottky diodes, this is an excellent opportunity to discuss them! Their low forward voltage drop and fast switching characteristics make them superior for most signal clipper and clamper circuits. The potentiometer adjusts the threshold at which the positive peak of the AC waveform is clipped. Follow-up question: modify this circuit to function as a variable negative peak clipper instead. Explain to them that the "double-chevron" symbol means "much greater than" (reversing the chevrons would mean "much less than," of course). What is the most likely cause of this problem, and how would you verify your conclusion with further measurements? The diode might be failed open, but this is only one possibility. Have your students figured out any other possibilities for the fault in this circuit? They do exist, and in fact may be more likely than a failed-open diode! Ask your students how and why they chose the answer they did, and be sure to have them explain their follow-up diagnostic procedures. Explain how the AM radio signal becomes "demodulated" into an audio-frequency signal, through the clipping action of the diode. 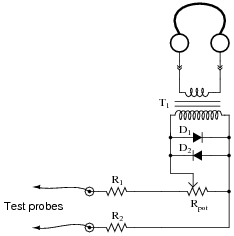 This simple AM "detector" circuit is widely discussed in basic electronics textbooks and other technical literature. There is little I can say here that would expand on what is already written about these circuits. I leave it to you to do the research! 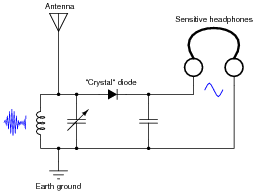 Ask your students to explain the purpose of each component in the "crystal" radio circuit, not just those components related to the clipping function. Clamper circuits are sometimes referred to as DC restorer circuits. Explain why. Does a "clamper" circuit change the shape of a voltage waveform, like a "clipper" circuit does? Explain why or why not. "Clamper" circuits provide just enough DC bias voltage to offset an AC signal so that almost its entire shape occurs either above or below ground potential. 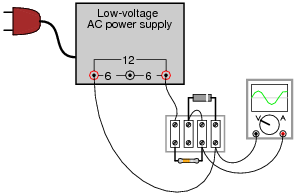 Ask your students to provide an example of a clamper circuit schematic. Follow-up question: how does the clamper circuit "know" how much it needs to bias the AC voltage waveform so that it gets shifted just enough to eliminate reversals of polarity? 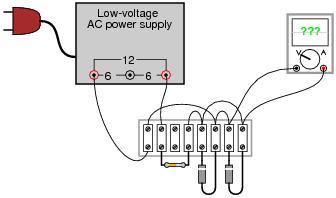 Would this circuit function the same if the AC voltage were increased or decreased? Explain why. Ask your students to replace the capacitor with a DC voltage source (oriented in the correct polarity, of course), and explain how the capacitor actually functions as a voltage bias in this clamper circuit. Have multiple students share their thoughts as to how they designed the clamper circuit. 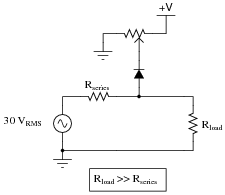 In this circuit, the values of capacitor C1 and resistor R1 are chosen to provide a short time constant, so they act as a differentiator network. This results in a brief pulse of voltage across R1 at each leading edge of the square wave input. Capacitor C2 and resistor R2 are sized to provide a long time constant, so as to form an integrator network. This time-averages the brief pulses into a final DC output voltage relatively free of ripple. Explain what happens to the output voltage as the input frequency is increased, assuming the input voltage amplitude does not change. Can you think of any practical applications for a circuit such as this? The DC output voltage will increase as the input signal frequency is increased. This lends itself to frequency measurement applications. Do not accept an answer from students along the lines of "frequency measurement." Ask them to provide some practical examples of systems where frequency measurement is important. If they have difficulty thinking of anything practical, suggest that the input (square wave) signal might come from a sensor detecting shaft rotation (one pulse per revolution), then ask them to think of possible applications for a circuit such as this.